Good Tuesday morning. I have two clean and simple projects to share with you today using dies from the Impression Obsession winter die release. Both cards could be easily be mass produced for holiday cards. My first card was made using the Merry Word Block and was paired with the Large Poinsettia, Small Poinsettia and Pine Pair. 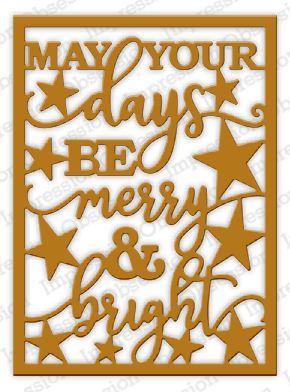 Cut the Merry Word Block using white cardstock. Apply thin strips of mounting tape to the back of the word block frame and small pieces behind the stars. Attach word block to the red 3.25″ x 4.25″ layer. Apply strips of mounting tape to the back of the red layer and attach it in the lower corner of the card base. 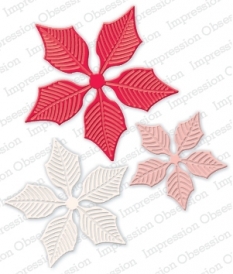 Use green cardstock to cut the smallest flower from the Large Poinsettia set and use red to cut all three flowers from the Small Poinsettia set. Lay all the flower sections face down on a molding pad and form petals using a round stylus. Lay all the flower sections face up and push down in the center of each with the small tipped stylus. Attach all petals together using glossy accents. Cut the Pine Pair sections in green, trim off the ends to shorten and attach to the corner of the word block using glossy accents. Attach the poinsettia to the corner with glossy accents to finish. Cut the Ornament strip using red cardstock. Cut a 5.50″ x 1.75″ white layer. Apply 1/8″ double stick tape to the back of the ornament strip and attach to the white layer. Apply mounting tape to the back of the ornament layer and attach to the red card base. Cut Pine Sprig Cluster in green. Attach two sections of pine sprigs to the top of each ornament using glossy accents. Finish by attaching a small red single layer bow to the top of each ornament. You can check out the whole new Fall Winter die release by clicking here. And you will certainly want to check out the Impression Obsession blog to to get inks to all the team members new projects. Anyone leaving comments on my blog post will be included in a drawing for a $10 gift certificate. Leave your comments before noon on Saturday and I will announce the winner on my Monday blog post. I hope you have enjoyed seeing the projects I made for the Impression Obsession Winter Die Release. Thanks so much for coming by and I hope you have a great day. I absolutely love your red card… such a beautiful design! Beautiful die cuts and cards. Beautiful! Both are so simple and elegant!! These two dies make such simple but striking cards. Absolutely gorgeous! Lovely cards with these awesome dies! Love the poinsettia and greenery along with the Merry Word Block die! And your Ornament Strip card is beautiful too! Fabulous new dies! Love the strip with the ornaments. I like the simplicity of your second card. Two beautiful cards. The red is so pretty. Beautiful and elegant cards! I especially love the Poinsettia on the first card! Gorgeous! Love the classic red and the simple beauty of your cards. Absolutely beautiful! I love the poinsettia with the merry word block! Both of these are just gorgeous, I love how how you embellished the dies! poinsettia is so beautiful. I love them! Pretty card designs. I like the poinsettia on the first one. Both cards are beautiful! I especially love the new Merry Word block die as it does so much of the work for you. Love how the pine die adds the perfect touch to both cards. That must be IO’s best seller! Awesome cards! Love the new Merry Word Block die! Your ornaments are lovely as well! These cards look just gorgeous! Such elegant and pretty cards! So beautiful, Kitty! Love the bright reds & those gorgeous dies! Lovely cards, the red is so bold and beautiful with the white. Great cards. I love how you did the poinsettia. Stunning cards! Fantastic depth and dimension. Simply wonderful! Very festive with the tradition red and green. Simply lovely! Two great cards. The block die is amazing. GORGEOUS & JUST WONDERFUL, Kittie!!! ( I DO need to start thinking about Christmas Cards, huh? LOL I’m SLOW to do it!) 😉 LOVE the traditional colors & the GORGEOUS FLOWER & PINES you’ve made with these LOVELY DIES!!! 😉 SUPERBLY DONE, Kittie!!!!!!!!!!!!!!! Hi Kittie! I tried to contact you through your e-mail, but it says there is no page there! 🙁 So, I thought I’d try it this way. I think you have a gift code for me from this hop…..?????? 😉 Hope to hear from you soon!